Kid Nepro’s massive SP1200 sound library is now available for download in WAV, Reason or Kontakt file formats. Get that “Lo-Fi” – 12 Bit Dirty Drum Sound for your hardware or software sampler. Thousands of new SP1200 samples from one of our most popular sound collections. Without having to shell out all that cash for a vintage SP1200, you can now get the next best thing. 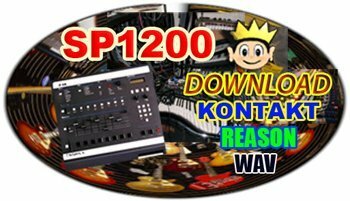 Much care was taken to preserve the original sound of the SP1200 when sampling the files and assembling the drum kits. The results are as close as you get to the real thing. 50 New Drum Kits made for creating killer beats in no time. And, over 200 new WAV and REX Loops that will jump start your tracks. A wide assortment of drum kits now available including old favorites like the TR808 and TR909 to custom Hip Hop, Trance, Rave, House, Cyber and Techno Kits. All arranged for easy set up with any sampler.